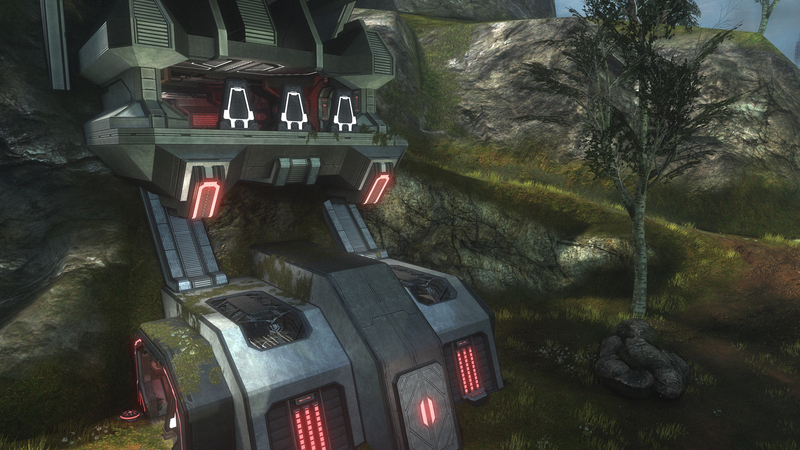 Map and weapons layout to match the version of Timberland seen in the Halo:Reach Anniversary map pack, Ridgeline. Fully playable, but still sorting out minor aesthetic details and weapons/vehicle locations and map testing. Supports all gametypes. Video soon. Blaze, Randy 355 and Ryouji Gunblade like this. I just shat simple primitives. Those bases look fantastic. PharmaGangsta1, Randy 355, SheapCreaper and 1 other person like this. So I gave it a closer look and I hope you'll be able to flesh out the river like Viking. The vehicle blockers in the base could use an update, and I also prefer the SPNKR. Your clever use of glass to make the forerunner lights is amazing though. Thanks for your constructive criticism. What do you mean by flesh out the river? I do intend to watch a couple more videos and do some more work on the hills, etc. Also, I realized the trees aren't all placed at one of the bases. I'm also not sure what you mean by blockers needing an update. I will definitely swap out the rockets for the SPNKR, hadn't even thought of that. The river effect I'm referring to is here. Oh yeah, I did that on my Mists of Time map (remake of Destiny's Shores of Time) but I hated the "fakeness" of it :/ so I opted for a dry river bed. I may change it to the fake water, idk. I did change the layout of the river some after your comment, though, since I'd taken a closer look and saw there was more of a curve to it. I went through the entire map while watching videos, and changes some of the landscape to better match the original map. Also smoothed out a ton of driving spaces, and widened some routes. Tree placement was also tweaked some. I swapped out the SPNKR for the other rockets on the side bases. I looked at this map in forge the other night. I'm very impressed with what I see! It feels like the map from Reach. It's amazing work. That said, there were a few things I noted from my runthrough that I would hope to see improved. From the top of each base looking at the other, there were some noticeable framerate issues. I believe a few other areas suffered from this as well. I also noticed that inside the bases the walls were almost pitch black, whereas the floor was very bright. The base looks great, but this was a little jarring to look at. I would also agree trying to give the rivesome water, though I'd suggest using the Decal Trick to get convincing flowing water. Other concerns were that having the overshield substitute for a health pack so close to the rockets may give individual players too much power. I really do want to get some gameplay on this sometime. If I do I'll let you know what I think of the gameplay! Haven't looked at it yet, but I will chime in about the river on Viking. For the love of Halo, do not do that. It's a fake, well hated, thing that people find ok... It's horrible unless you use it as ice. Haha, okay. I should've suggested the decal one. Yeah the "frozen water" look on Viking through the grassy, rolling hills, makes me want to cry. So many better options, the remake is near perfect, but good god I hate that, lol! Thanks, guys, for your positive feedback. ...From the top of each base looking at the other, there were some noticeable framerate issues. I believe a few other areas suffered from this as well. I have absolutely no idea how to fix this, short of putting a lid on the awesomeness of humongous Promethean structures :/ regardless that I've put a massive amount of hours into my maps, there is still a ton I don't know. For example I only just learned you can click in your right thumbstick to locate a piece you are currently holding. I will definitely try the decal effect on the river and see how I like it. I think not having that metallic sound when you walk on glass instead of water might sway me in that direction. I will also add some lights in the bases, so the walls aren't flat black. Re the health pack: testing, testing, testing if it works, it works, if not, I'll def have to tweak it. Looking forward for this map to be fully completed. When do you think it'll be? And once it is, will you be saving a new version or will you just update this current file? Hi, Zeon. The map is fully playable as it is, I will only be changing weapons and vehicles placement and making aesthetic changes. I will be keeping the download link and updating the current file as I go. I will also be adding flag cap and return stands for Yellow and Green teams, and adding in a couple initials for all the other colors, just to make "all gametypes playable" complete. If I were to check the hill elevation accuracy, would you prefer the original for reference or Reach? Reach. That is the only one I played on and the one I grew to love. So how the heck do you do that? I'm gonna load it up via backwards compatibility and use hill markers and crates as reference. Hill markers are your measuring friend, and when placed on flat surfaces, help you figure out how tall things should be relative to each other. Nokyard could give you the best advice on this. He's doing Avalanche. Edit: So I compared the immediate outside area of Ridgeline to your map and found that your turret platforms are uneven to each other. The outer paths away from the bases (the one to the bridge for example) are too low, but the upper hills above those are okay. Keep in mind that the bases are sitting in a bowl-like area with short and tall hills around it. Played FFA sniper with some friends this past weekend on this map. While the map does look pretty good we had constant framerate issues and the spawns would occasionally drop us mid-air. Was quite funny to see guys dropping in. I do agree the center river needs some work. Would love to see a real river there! And there is an issue with the brightness. Outside of one of the bases the warthogs are blinding. The vehicle blockers are kind of odd as well. Bases are good. But my friend you so far have done a great job on this map. Does have that Timberland/Ridgeline. Would like to see a hidden Grunt Doll like we saw the hidden GRD Doll in Ridgeline. Just a after thought.